Recent release “The Adventures of Eli and Jake” from Page Publishing author Linda Hoffman is a book of short stories for young readers celebrating the excitement of moving into a new home and other tales of family and friendship. Linda Hoffman, a mother, grandmother, and great-grandmother, has completed her new book “The Adventures of Eli and Jake”: a collection of charming stories about two active young boys and their animal friends. 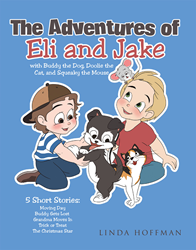 “The Adventures of Eli and Jake” begins with the boys moving to their new house and Buddy the Dog and Doolie the Cat making a new friend, Squeaky the Mouse. While having great fun with Buddy, Doolie, and Squeaky, the boys learn valuable lessons. Published by New York City-based Page Publishing, Linda Hoffman’s delightful book comes with different short stories, all with the same characters but with various themes that tell of compassion, camaraderie, obedience to one’s elders, and being true to one’s promise, in a wise and unforgettable adventure. Readers who wish to experience this engaging work can purchase “The Adventures of Eli and Jake” at bookstores everywhere, or online at the Apple iTunes store, Amazon, Kobo, Google Play or Barnes and Noble.